The park on China Road is in its sixth year and is only getting more popular, the family said. 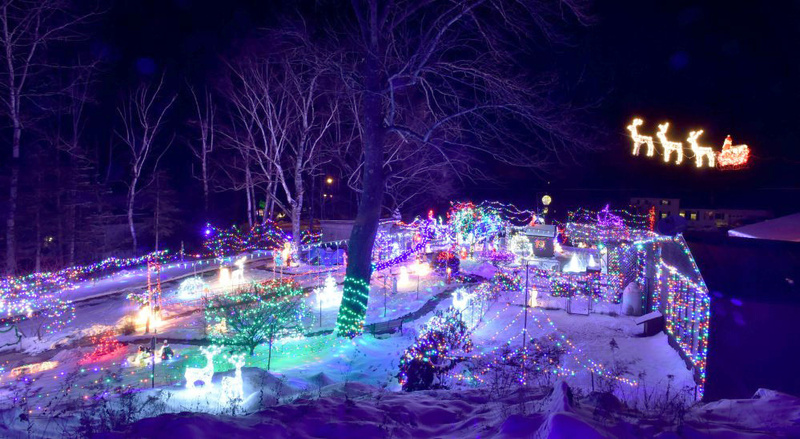 WINSLOW — About six years ago, a family group that lives on adjacent properties on China Road started to have a playful competition with their annual Christmas lights and decorations, and it got a little out of hand. Out of that competition came something for the whole community: the China Road Christmas Park. “It’s a Christmas present to the people,” said Donald Lagasse. Most of the lights are on his and girlfriend Linda Lagasse’s property at 1229 China Road in Winslow, but there are also sections on properties belonging to Chad Lagasse and Ric and Tanya Spaulding. Chad Lagasse is Donald Lagasse’s son, and Tanya Spaulding is Linda Lagasse’s daughter. The family changes how the lights are set up every year and always shops for new ones after Christmas. Donald Lagasse, a retired disabled veteran, also spends a lot of time taking care of the lights, which he said can last a long time if he maintains them and fixes problems such as broken fuses. About four years ago, Ric Spaulding found the sign they now use to advertise the park, which got its name from the visitors, the family said. Before, people would drive by slowly but wouldn’t to pull in; now they know they can come in and walk around. And hundreds do. The family said in one night they can get 100 people, and on a Saturday they can get 200. Often people come more than once during the season. Six people stand out in the driveway throughout December to direct traffic. Part of the draw is the price of admission — which is free. 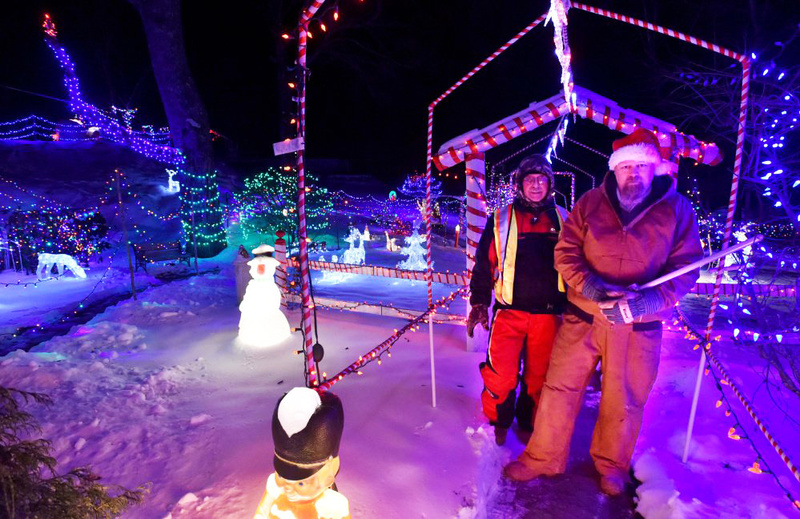 “How many places can somebody say today you can go see Christmas lights and it doesn’t cost you anything?” Donald Lagasse said. 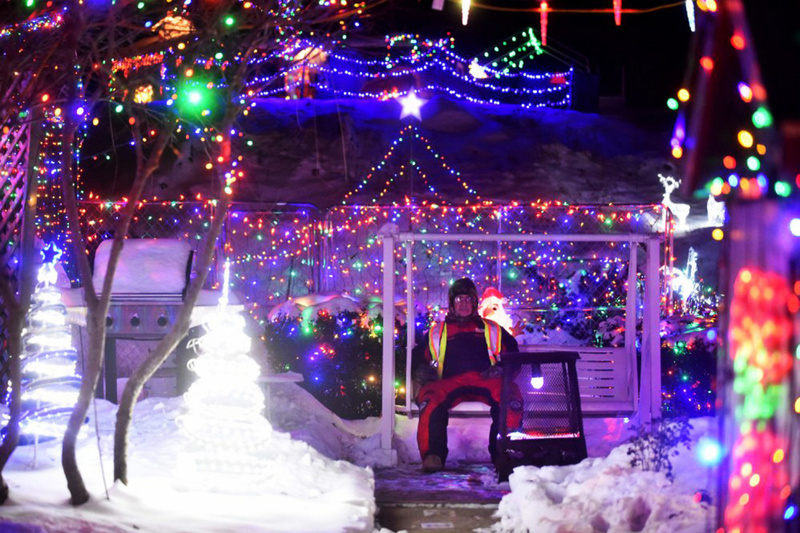 Donald Lagasse said he does this all to see the looks on people’s faces when they see the lights. He described an elderly woman who had trouble walking but demanded taking a stroll through the park to see it, and a child with multiple sclerosis who lit up when seeing the displays, including one of Big Bird. Ric Spaulding said people from all over stop to see the lights. They’ve had people come by who were from Charleston, Belfast and Bangor, he said. “It’s the kids and the elderly that enjoy it the most,” Donald Lagasse said. On Wednesday a bus from Mount St. Joseph’s Nursing Home brought people to the park, and the decorators also had groups from the High Hopes Clubhouse, a center in Waterville for adults with mental illnesses. The electric bill for just the park is about $150, but it used to be $500 before the families switched to using LED lights, Donald Lagasse said. The most difficult part of running the park is the parking, Ric Spaulding said, which is spread throughout the family’s three homes as well as a few neighbors’ houses. Donald Lagasse starts building the park, which he said “builds itself,” in the beginning of November. Usually by Dec. 1 the park is open every night from 4:30 to 8:30 p.m.; however, people should check the park’s Facebook page to see if it is closed because of bad weather. The park closes after New Year’s Day. Every Saturday, Santa Claus, played by neighbor and Linda’s grandson-in-law Robert Spencer, pays a visit to the Christmas Park from 6 to 8 p.m. The family also serves hot chocolate and cookies for free, going through at least 10 gallons of hot chocolate every Saturday, Linda said.